Pizza With A Cop - Please Join Us! 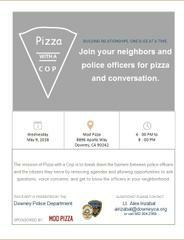 Downey Police will be partnering with MOD Pizza for Pizza with a Cop, an event created so that residents and Downey Police Officers may have the chance to chat, and discuss any concerns or questions without any agenda or presentation. A casual night out with your local law enforcement!